Malaysia Land Properties Sdn Bhd (Mayland) today launched Hampton Damansara serviced apartments at Country Heights Damansara, the retail, residential and commercial property developer’s first project in over three years. 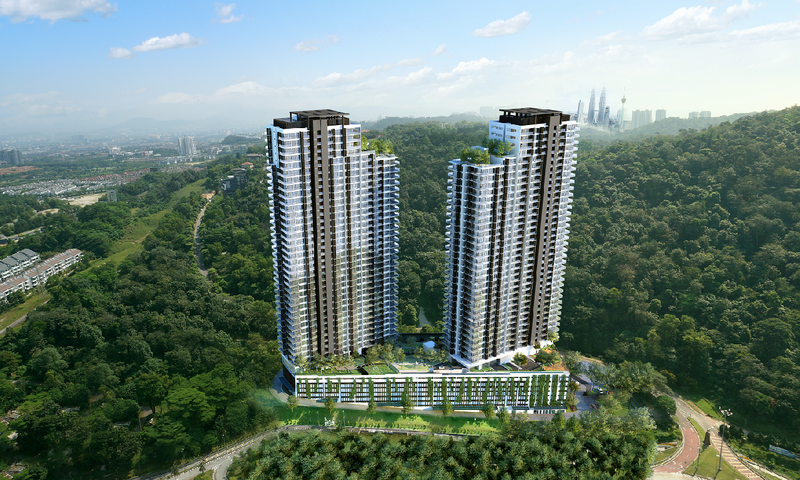 Built on 3.2 acres of land, this development will generate over RM700 million GDV. Hampton Damansara’s 700 residential units are spread over the twin 43-storey towers, pampering the residents with the 70,000 sq. ft. lifestyle floor with 46 facilities for sports, leisure and entertainment. “Hampton Damansara is a development of affordable luxury serviced apartments, located at the prestigious Country Heights Damansara address, which towers over the backdrop of a pristine green lung,” said Dato’ Kevin Woo, Managing Director of Mayland Group of Companies. Practicality does not mean a compromise on design and layout. The market insights have helped the team to develop the right composition of units with only 5 choices of layouts ranging from a 2-bedroom to Dual-key units. The majority of the units will be allocated to the 2 popular layouts: 2+1 bedrooms (915-924sq.ft.) and 3+1 bedrooms (1,351sq.ft.) with 60% and 35% respectively. The RM5.8 million 70,000 sq. ft. lifestyle floor at Hampton Damansara will be a conversation piece by itself. Featuring 46 lifestyle facilities including the first crystal salt sauna in a serviced apartment development in Malaysia, an Olympic-size salt water swimming pool, aqua gym, yoga deck, children’s water playground, indoor golf simulator and many more, residents will be spoilt for choice. For residents’ convenience, there will also be retail shops from cafes, to a mini-mart, laundry and a hair salon. To provide the comfort of security to the residents, the development is designed with impregnable security of over five tiers of protection. The easy access and convenient connectivity to Hampton Damansara will be through the main Lebuh Damansara-Puchong (LDP) highway as well as via the more discreet and verdant hill-road. Access to eight highways, the LDP to both the Penchala and Kerinchi links that access the NKVE and DUKE also means one can easily travel to main destinations within the Klang Valley or onward to the rest of Peninsula Malaysia, whether north or southbound. Hampton Damansara’s close proximity to established townships means easy access to eight shopping centres like IKEA, The Curve, 1U, Publika, Hartamas Shopping Centre to name a few and a choice of ten public, Chinese and private schools including (SJK (C) Puay Chai, SMK Bandar Utama, British International School KL and the International School @ Desa Park. “Over the past couple of years of consolidating our product and service offering, my team and I have embarked on a quest to bring changes and improvements for the benefit of our customers. As an architect by training, I am also very focused on the quality of products developed for our customers. On the product front, Mayland will adopt the CONQUAS accreditation process that ensures quality of workmanship and materials is never compromised. Quality will be assured with Hampton Damansara’s strict adherence to CONQUAS (“The Construction Quality Assessment System), a Singapore-certified standard assessment system that dictates a minimum construction quality level for completed building projects. “On the service perspective, we have brought in a very experienced marketing team under the leadership of Steven Wei, Senior General Manager and Mayline Chua, Senior Manager of Sales & Marketing, and their team formerly from Sunrise Berhad. We will initiate our customer-first policy, from re-training our sales and customer service teams to handle presales, purchase and after-sales service to the handing over of the units. There will be dedicated and well-trained handover teams who will professionally address homeowner concerns during the handover process, ensuring a totally stress-free and joyous occasion when receiving their keys,” added Dato’ Woo. Price-wise, Hampton Damansara offers a more than palatable proposition to potential investors within this location, quality of the development and the myriad facilities, where affordable luxury can now be a reality to home seekers. Mayland has a considerable land bank of more than 500 acres and are expected to launch flagship projects in other prestigious addresses, located adjacent to Sierramas West and at Persiaran Stonor KLCC by the second quarter of 2017. With over 2000 luxury affordable and high-end residences in the pipeline, the group is expecting a GDV of close to RM1.8 billion. Interested home buyers can visit the Hampton Damansara show gallery located at the 8trium, Level 3 at Bandar Sri Damansara.